Multi Metals are specialists in bespoke aluminium extrusions, establishing a reliable and cost effective supply of materials for manufacturing and engineering companies of all sizes. We can source the custom extrusions your business needs from mills around the world and provide a full stockholding service, ensuring availability of materials and helping you to manage your working capital. 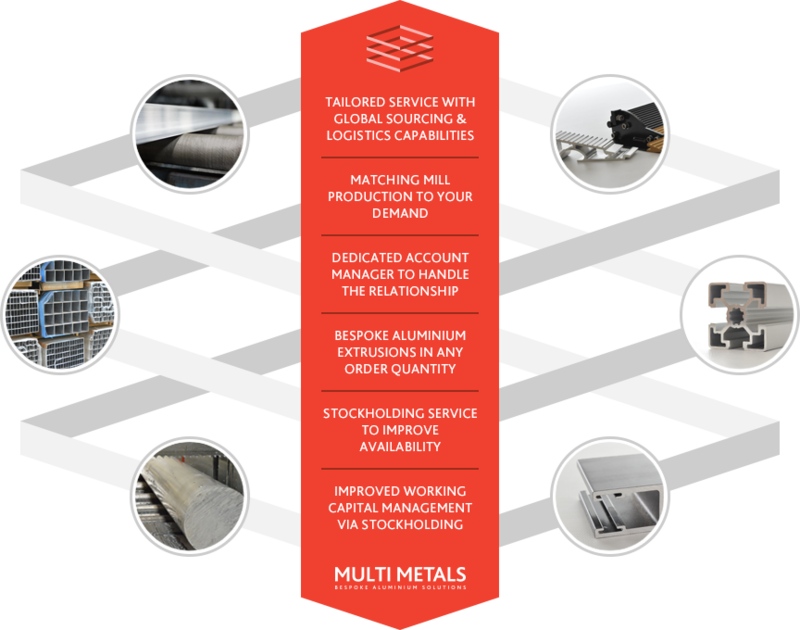 Our service ranges from simple matchmaking - finding the right mill to produce your bespoke aluminium extrusions - to a full logistics solution that handles every step of the process. Simply tell us what your business requires and we’ll adapt our service to meet those needs. Discover how we can save you money and improve availability in your bespoke aluminium extrusion supply chain. Learn more about the types of specialised manufacturers that Multi Metals have experience of supplying custom aluminium extrusions to.